Intel lists the idle power consumption of the X25-M at 0.06W and the "typical workload" power consumption as 150mW. This is far lower than any conventional hard drive and relatively comparable to other SSDs. In a desktop system using the Intel X25-M will shave off around 3 - 5W of total system power at the outlet under idle or load conditions. The savings are less compared to a 2.5" drive, but the real question there is how much more battery life do you get if you switch to the X25-M? 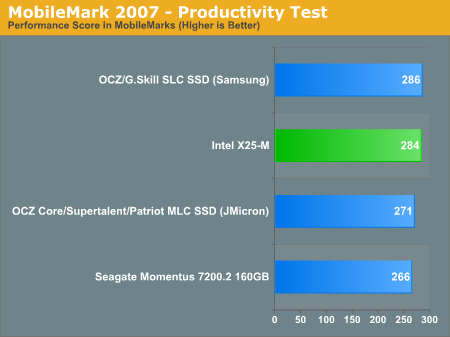 We didn't have enough time to run through a full suite of battery life tests but using MobileMark 2007's Productivity test I looked at the Intel X25-M, the OCZ Core (JMicron based MLC), the OCZ SLC SSD (Samsung based SLC) and the Seagate Momentus 7200.2. 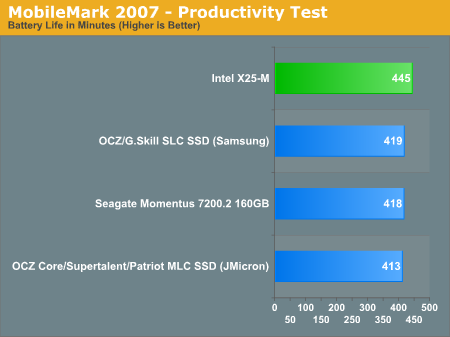 Overall performance was highest on the OCZ SLC SSD, but only marginally compared to the Intel X25-M. The OCZ Core managed to come in third place, still faster than the mechanical disk. The battery life of the system was actually lower with the OCZ Core, presumably thanks to the strange write performance issues. But generally the SLC, MLC and HDD all last around the same amount of time. Intel's X25-M boosted battery life by a bit over 6% or 27 minutes, not an insignificant increase in battery life.